We continue to showcase the products developed by our customers. 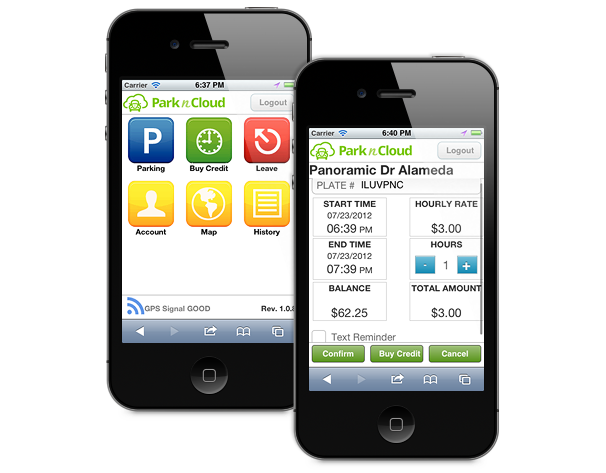 This time we would like to introduce ParknCloud, an innovative service delivered by Mylaensys, LLC. ParknCloud can be used by consumers to pay for parking using a smartphone and provides municipalities an easy and affordable way to collect parking fees electronically. With just a click on a smartphone, consumers can check where the service is available, rates, schedule, buy parking credits and set up a text reminder. 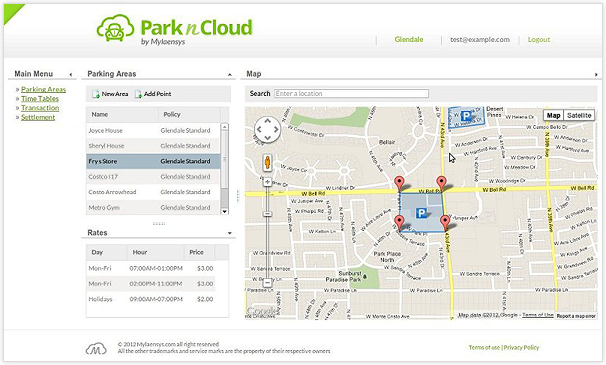 Compared to other electronic parking solutions, ParknCloud is based on Geoparking and cutting-edge technology. The challenge of the project was to create an innovative service based on state-of-the-art technologies able to serve thousands of users worldwide, in a cost effective way, providing an enhanced user experience on web browsers. In addition, we wanted to create a single application available on major platforms that is easy to maintain, instead of creating platform specific app. The development team has been familiar with and have used the DHTMLX component suite on numerous projects since 2009. The most appreciated features of the DHTMLX library are the perfectly integrated set of standard user interface components, a well designed API easy to understand and the ability to combine the necessary components in a single file using the LibCompiler. Due to limitations of our target environment, files greater than 1Mb were not compressed and stored in cache. The LibCompiler was particularly useful to include all needed components in a single file below 1Mb in size. After some tuning there was a significant improvement in performance and bandwidth usage reduction. During the mobile application development, we started prototyping the user interface with several frameworks and when the DHTMLX Touch 1.0 was released, we decided to adopt it. DHTMLX Touch is delivered with a flexible licensing model and fits perfectly with the requirement to create the same user experience of a native application, both for iOS and Android. The development team became quickly familiar with the intuitive programming syntax appreciate the large set of code examples and the extensive documentation available. Reuse server-side components for the DHTMLX and DHTMLX Touch. Easily integrate the Google App Engine platform. Keep developers focused on program logic, designers on layout, colors and user interface without interfering with each other. ParknCloud is currently running a Virtual User Trusted Tester Program in various major US Cities, in preparation for the upcoming production release. We have received positive feedback on the usability and the performance of the application, including inexpensive low end mobile devices. We strongly believe that DHTMLX is the right choice to create an eye-catching application that provides a friendly user experience, both on desktop and mobile devices.